During World War II, he briefly joined the Merchant Marine and the U.S. Navy, and after the war, in 1947, he met Neal Cassady, with whom he would in the late 1940s begin crisscrossing the country by automobile. Kerouac wrote his first novel, “The Town and the City,” about his struggle to balance the expectations of his family with his unconventional life, which was published in 1950 with Ginsberg’s help. 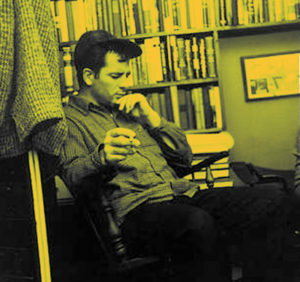 Kerouac took several cross-country trips with Cassady during this time, which became the basis for his most famous work, “On The Road.” The manuscript – presented to his editor on a single, unbroken roll of paper, the scroll that was later exhibited to record crowds in Lowell – was rejected and six years would pass before it was published in 1957. In the years in between, Kerouac followed Ginsberg and Cassady to San Francisco and the term “Beat Generation,” which Kerouac coined, gained popularity. When Kerouac finally broke through with the release of “On The Road,” he was faced with challenges presented by the fame that followed as he tried to live up to the image portrayed in his novels and facing criticism from the literary establishment for being part of what was considered a fad. He would go on to publish additional novels, many of which used settings based on Lowell – including “Doctor Sax,” “The Subterraneans,” “The Dharma Bums” and his final great work, “Big Sur.” He settled in Florida with his wife, Stella Sampas, and his mother, where he died in 1969 at age 47. He was buried in Lowell. Even after his death, Kerouac’s popularity continues. “On The Road” has remained widely read and a new film adaptation of the novel starring Garrett Hedlund and Kristen Stewart recently premiered at the Cannes Film Festival. Kerouac was named one of the most important figures of the 20th century by LIFE Magazine and The Times of London and interest in Kerouac has grown with the publication of his letters, poetry, spiritual writings, early novels and more from his remarkable literary archive. He has been cited as an influence by countless writers and musicians, including The Doors, Bob Dylan, and Patti Smith.